From today Looting Matters will be releasing a weekly story via PR Newswire. 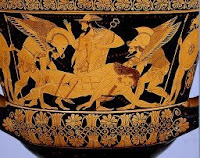 This week's featured post is on the Euphronios krater: "Why Does the Return of the Euphronios Krater to its Original Home Awaken Debate?". Is that a genuine suspicion, or is that an attempt to create an association in the mind of the reader without having to find any evidence?